Healthy dental hygiene starts early in a child’s life. Most parents know this, but many are surprised at just how soon these good habits start. One of the first dental hygiene questions parents encounter is, “what age should a child go to the dentist?” The answer may surprise you. A child should go to the dentist the first time within six months of getting their first tooth. This means the age a child should go to the dentist is about one year old. This is surprising to many parents; a study by Mott Children’s Hospital showed that many parents never received any guidance about when to take their child to the dentist, and only 35% of parents knew the best time was before the child’s first birthday. But My Child Only Has One Tooth! With only one tooth showing, it may seem too early to bring your child to the dentist. However, the next teeth come in quickly after the first, and it is essential to make sure they are healthy. The first tooth can show the health of the other teeth that will soon appear. If these teeth are damaged early on, they can cause pain and discomfort for your child, and may even require fillings or surgery to resolve. Another reason parents may put off their child’s first dental visit is the assumption that babies can’t get tooth decay because their teeth have just appeared. This is not the case. Baby bottle tooth decay, also called early childhood caries, affect a child’s primary (baby) teeth. This begins with the very first tooth. This is why every child should go to the dentist before their first birthday, or shortly after their first tooth appears. Can a Dental Visit Prevent Tooth Decay? You child should go to the dentist at about a year old to assess their oral health and also to take preventative measures against tooth decay. Your dentist can give your child’s first tooth a fluoride varnish, which will strengthen the tooth’s enamel and prevent bacteria from eroding the tooth’s enamel. During your child’s later routine dental visits, the dentist can also protect your child’s teeth with dental sealants. What If My Child Is Scared? It’s difficult to communicate to a one-year-old who a dentist is. Many parents aren’t sure about what age a child should go to the dentist in the first place, and they put off the first dental appointment because they’re not sure how their child will react. Other parents may not like going to the dentist themselves, so they put off appointments for their child as well. However, children will understand and adapt to the dentist much better and easier if they go early. When they’re only one year old, infants mostly take cues from their parents. When you’re nearby to comfort your child, they’ll see there’s no reason to be scared and they won’t see the dentist as a scary appointment later on. What Dentist Should I See? A dentist that’s right for adults may not always be the best choice for babies. Pediatric dentists are trained specifically to work with young children and address the oral healthcare issues that affect them. A pediatric dentist will know how to keep children calm and how to approach dental hygiene in a fun and easy way. Since this first visit will set the stage for how your child feels about the dentist, finding the right professional can make a big difference. When Should My Child’s Second Dental Visit Be? At about one year old your child should see the dentist for the first time. This is the beginning of a lifetime of good dental hygiene. To maintain this, your child should visit the dentist every six months. 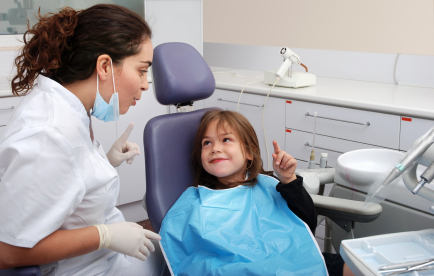 At each visit, your dentist will tell you if your child has any cavities or tooth decay issues. Eventually, your dentist will schedule x-rays to make sure your child’s teeth are coming in properly. What are the best methods to care for your child's smile?